Behave well; Be prim & lady-like. You're a Princess- you've no choice..."
Felt like a pawn on a board of Chess! Despite this, she had a mind of her own. They couldn't set her life's tune or tone. To suppress her freedom, they were keen. "She walks as though she owns the world!" She had developed her lasting shield & anti-glare! A pretty crown adorns her head & soul now. They can't see it; can't appreciate or exclaim-"Wow!" Do you feel the world imposes & can't "see" talents & wishes? Are you conscious of your crown? Do you feel like a Princess or Prince and soon-to-be Queen or King? Brilliant Anita. A tight slap to the hypocrites who expect princess like behavior. This is so well written! You have captured the entire 'drama' which happens! I wish girls were taught how to be like this from a young age. Interesting, but I never had much to do with princesses and princes, kings and queens (except for Chess). We all have listened to that advice and the do this, do this, don't do that's of our parents. But we all find our own way eventually, don't we? 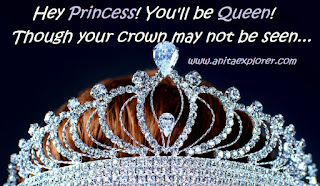 While to be a princess might sound alluring, I think one would pay a great cost in personal freedom. I like your princess, with her inner strength. Coincidentally, I wrote about a female doing things her way today, too!